This entry was posted in Series and tagged and to be built, Do you have a headache?, Does your head hurt now?, dutong, happen, headache, I have a mild headache., I have a severe toothache., I still feel pain in my head., intense, migraine, occur, pain, Recently my tooth hurts. 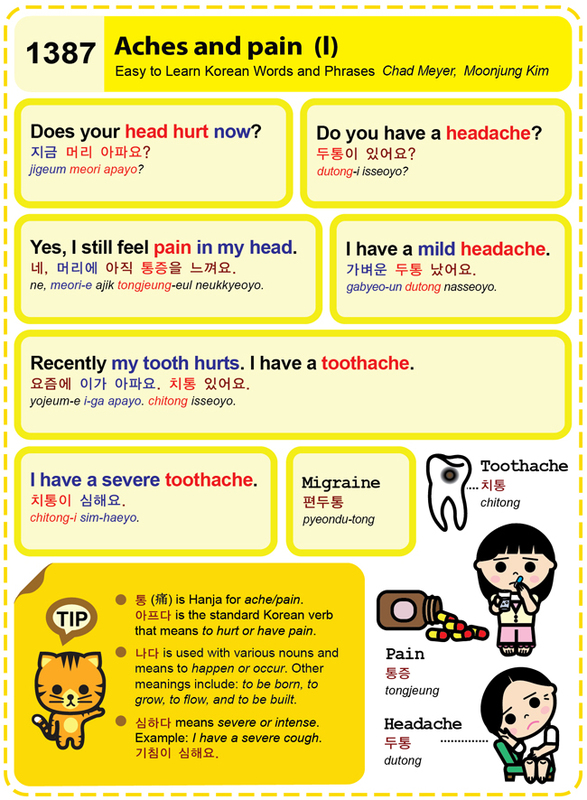 I have a toothache., severe, to be born, to flow, to grow, tong, tootache, yes, 痛, 가벼운 두통 났어요., 기침이 심해요, 나다, 네, 두통, 두통이 있어요?, 머리에 아직 통증을 느껴요., 심하다, 아프다, 요즘에 이가 아파요. 치통 있어요., 지금 머리 아파요?, 치통, 치통이 심해요., 통증, 편두통 by easykorean. Bookmark the permalink.